Work on the marketplace spanned from initial conception to implementation of the Employee, Employer and Carrier portals. 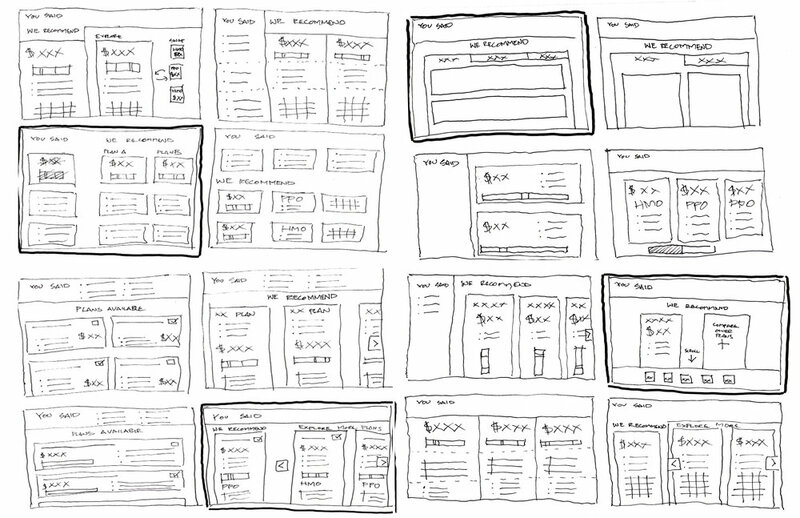 All work crafted by a core team of two experience designers, including myself. The marketplace currently operates in California, Colorado, Massachusetts and New York. To kick off the project, our team conducted a week long design sprint with Fidelity's internal business team, and their technical partner. This process was guided by findings from a multi day deep dive into the competition, stakeholder pains/gains, and terminology of benfits. Two elements of the product that became increasingly clear were the necessity of quality way-finding, as well as highlighted plan comparisons. Quality way-finding was crucial in both allowing a user to know where they were in the sign up process (aka how much more time they were going to have to spend signing up), as well as explaining various benefit concepts or explaining how they can affect previous benefit picks. After seeing the thick packets of information regarding each plan that are traditionally given to employees, it became evident that the product needed to highlight how plans differed, and how they affected the aspects of the users of lives that they conciously followed (prescription costs, cost per paycheck, current doctor, etc.). 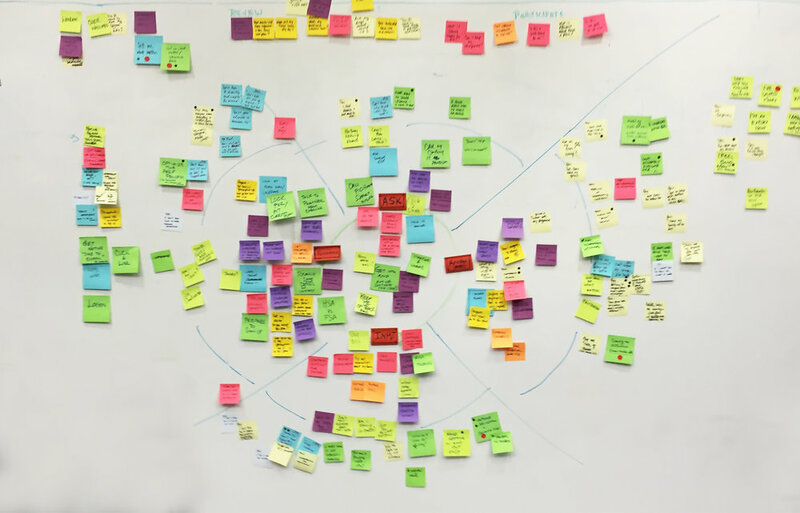 After the design sprint, and having tested the full flow Axure prototype with over twenty users, it became clear that the way-finding could be incredibly complicated and confusing without a simple concise flow. We eventually landed on six steps that provided reassuring way-finding for users, while also allowing for enough flexibility for the sometimes circular aspects of the flow to be captured in a single step. To address the plan selection problem, I focused on researching tangential product comparison tools (auto, jewelry, computer, credit card, home, etc). 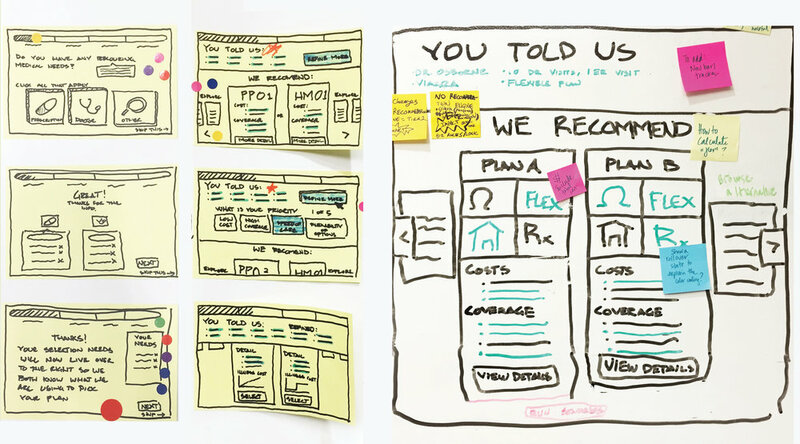 With this research, a variety of paper prototypes were created, and tested with users. In the finished product the plan comparison issue is tackled in a horizontal manner, allowing the user to see many plans at once, with the "conscious" differentiating factors called out. To accomplish this, all of the other plan details are included in a "show plan details" accordion. This allows the user access to this information if they would like it, while not overwhelming the user from the start. In the "tax savings" and "additional benefits" sections the plan types available are dependent on which plans were selected previously, but by containing the ebb and flows within one step we were able to keep a consistent global progress indicator.